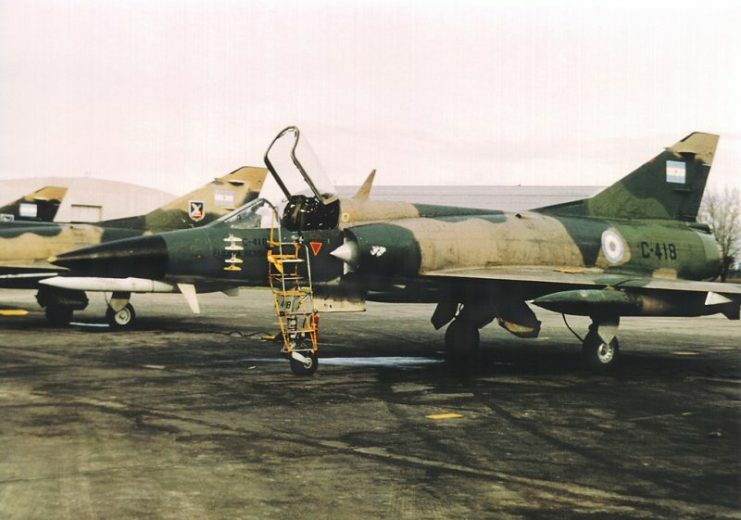 In May and June 1982, a group of Argentine pilots in 20-year-old A-4B Skyhawk attack aircraft seriously troubled the British forces in the Falkland Islands by damaging ten of their ships and sinking four. 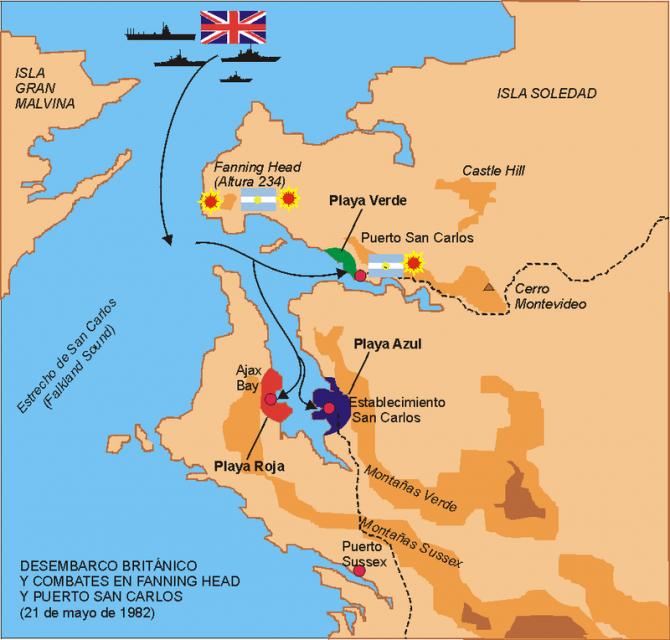 On April 2, 1982, a war took place between Argentina and the United Kingdom over the sovereignty of the Falkland Islands (Islas Malvinas), which had been under British control since 1833. 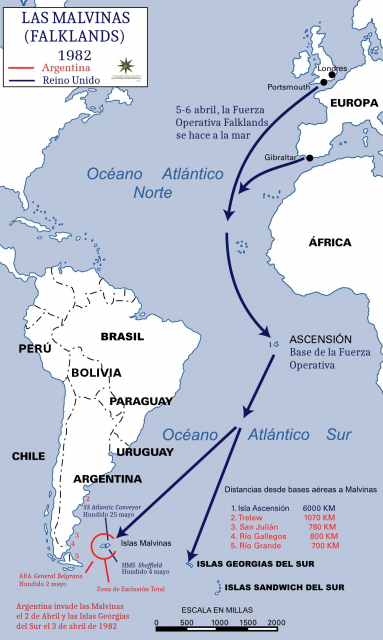 The Falklands War began with the launch of Operación Rosario, the taking of the Archipelago by the Argentine army. 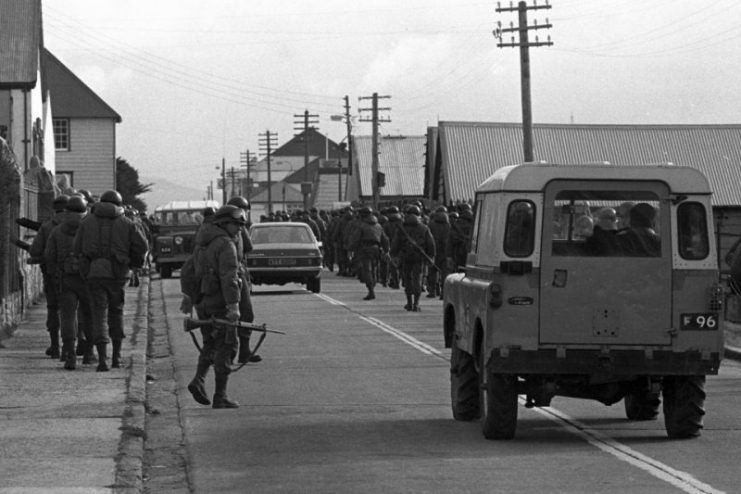 Argentine soldiers in Stanley during Operation Rosario. Falklands War. The United Kingdom responded with Operation Corporate, designed to retake possession of the islands. Despite the successful bombing of some British Royal Navy ships by the Argentine Air Force, Argentina could not prevent the disembarkation of British forces, which were superior in numbers and technology. Map of the operations theater of the Falklands War, and the distances between them and the different bases of both armies. The war culminated on June 14, 1982, with the surrender of an Argentine army that was physically and morally weakened. During the course of the war, the Argentine Air Force was a key participant. Even the British officers respected the fact that when the war began, many of the Argentine pilots did not have combat experience. 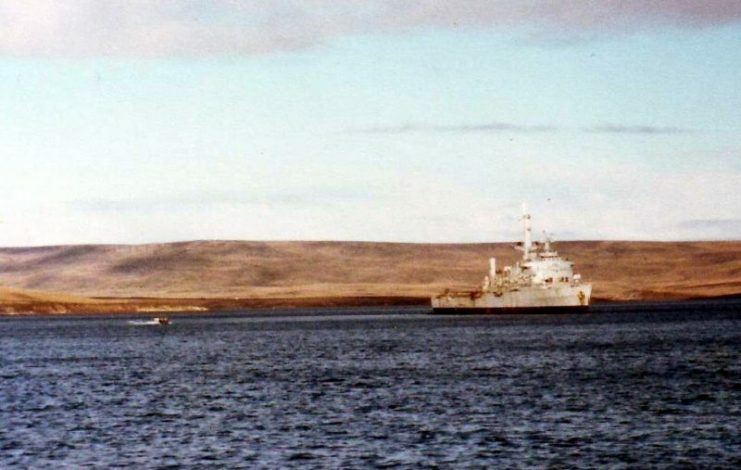 The Argentine Air Force deployed a TPS-43 radar in the Falklands to track the movements of the British fleet in the area, and to guide their own aircraft against it. After training, the pilots joined the war, making successful maneuvers that several times allowed them to neutralize attacks by the British army and cause severe damage to the Royal fleet. Some of these feats were achieved by the officers belonging to Group 5 of the V Aeronautical Brigade of the Argentine Air Force. Due to their conviction that the airplane and pilot were one, they are known in Argentina as the “Halcones” (“Falcons”). 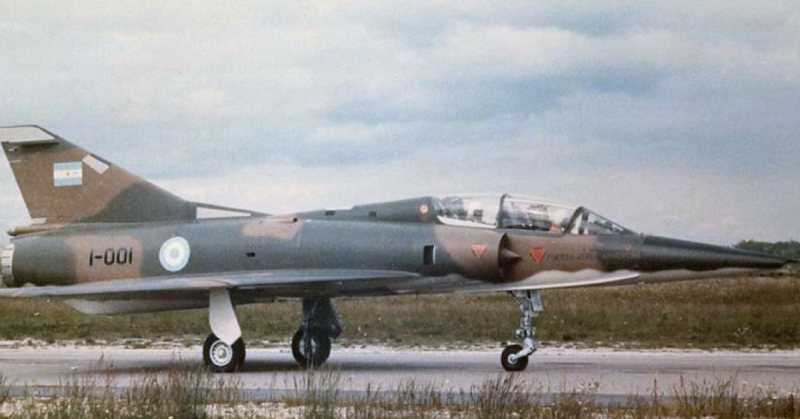 IAI Dagger, Argentine Air Force, 1984. The strategy developed by the Halcones for their assault on British ships consisted of flying near sea level and keeping radio silence during the entire attack maneuver. Communication between the pilots was done through signs, which lowered the chance of the aircraft from being detected by the British. Generally, an Argentine attack was performed by several squadrons to saturate the defensive systems of the British ships. Lieutenant Crippa, who belonged to the first squadron of the Naval Aviation Command, was decorated for his performance in the first air attack on the British landing in Port San Carlos. On May 21, 1982, the Command entrusted Lieutenant Crippa with a reconnaissance mission in Port San Carlos, where he was received by the antiaircraft artillery and missiles of approximately a dozen British ships. Lieutenant Crippa, who piloted an Aermacchi MB 339339A military training and light attack aircraft, attacked the British frigate HMS Argonaut with unguided rockets, causing some damage to the ship and its radar. In order to return to his base, Crippa had to perform a very high risk maneuver–passing through the middle of the British ships. They had to suspend their fire momentarily to avoid friendly fire, which allowed Crippa to escape. Later, in a sketch, Crippa identified and located each of the British units that he had observed. Thanks to this information, further actions were taken against the British forces. That same day, the 2nd Aeronaval Squadron of the Argentine Air Force successfully attacked the ships, knocking HMS Argonaut out of action with damage to its boiler room. 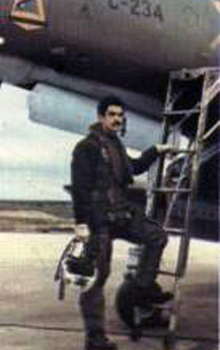 A pilot from Group 5, Captain Carballo was decorated for the leadership he showed during all his combat missions in the Falklands War. His most important mission was carried out on May 25, 1982, when the squadron that he commanded attacked a British naval force north of the Falkland Islands. On board his A-4B Skyhawk, Carballo commanded the squadron as they flew at sea level to avoid being detected by British radar. 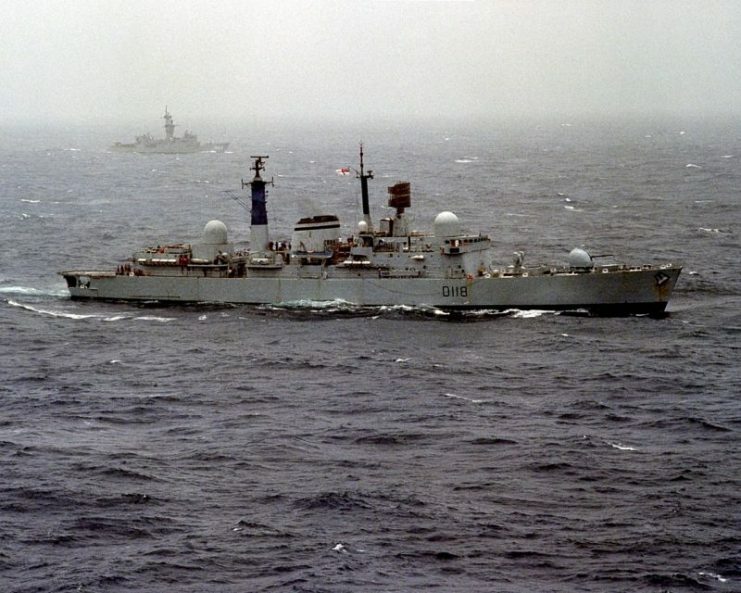 The result of the attack was the sinking of the destroyer HMS Coventry with 19 sailors killed and 30 wounded, while the frigate HMS Broadsword received severe damage and lost its Sea Lynx helicopter due to a bomb that bounced on the deck. 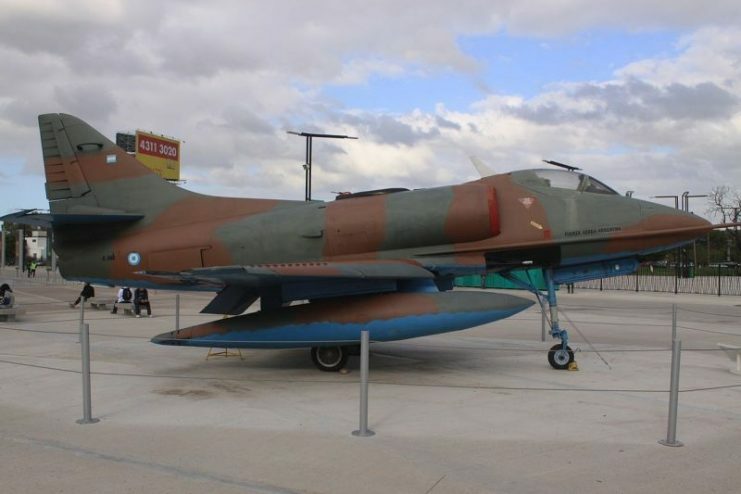 Among the missions in which First Lieutenant Cachón participated, the highlight is the one he carried out on June 8, 1982, in a A-4B Skyhawk. He became an impromptu squadron leader and carried out the Bluff Cove Air Attacks. 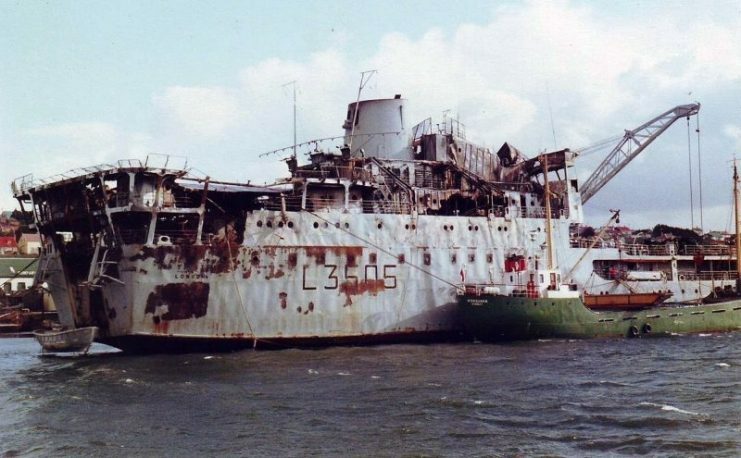 That day, considered by the British as the “Bluff Cove Disaster,” resulted in the sinking of the ships Sir Galahad and Sir Tristan, while they attempted to offload a large quantity of ammunition, equipment, and Welsh guards in the area of Bluff Cove in East Falkland. The mission was initially entrusted to two squadrons led by Captain Carballo and First Lieutenant Filippini, but when they refueled in flight, three of the eight aircraft in their group had mechanical issues forcing them to abort. These included the two squad leaders and they returned to their base. Although he had never performed this function before, First Lieutenant Carlos Cachón became the flight leader, and he was able to carry out the mission successfully by sinking the two British ships. 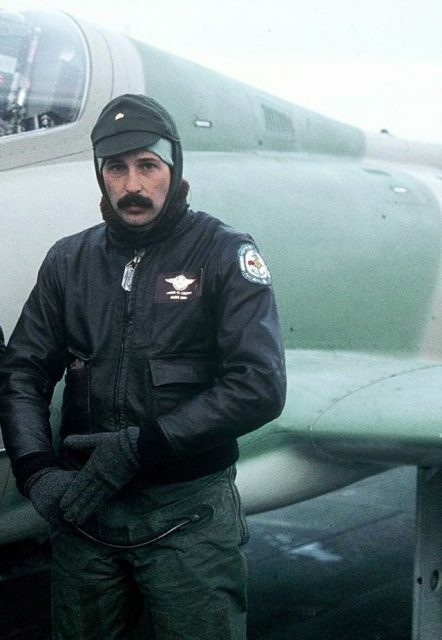 In addition to the “Halcones” Crippa, Carballo, and Cachón, other officers of the Argentine Air Force fought well in an attempt to prevent the British troop landings. Although Argentina did not win the war in the end, the combined navigation and combat skills of the Argentine pilots managed to delay the recapture of the Falkland Islands during May and June of 1982. A difficult task in the face of a superior opponent such as armed forces of Great Britain.